Abd. Without moderation of some kind this forum will fall apart and you will be here all on your own posting walls of text so boring that few bother to read it. If you think I am partisan, so be it, but it is not the case. So live with a little green ink and be happy. 1 - [...] dryness of the outlet steam [...] a factor of six, at least. 2 - [...] flowrate of the dosimetric pump [...] a factor of 2.5 of the thermal power produced. Congratulations Ascoli, I wasn't yet in the loop back then and hadn't studied this early test, but your summary is very telling. Actually it fits the scheme of "multiple redundancies" that Dewey mentioned a while ago. Even Lugano has two big measurement issues, one of which (electrical) may have been noticed and corrected early in the test but leaving traces. The post was edited 2 times, last by andrea.s ( Jun 22nd 2016 ). to mention being incredibly rude. Well being a member of the 'incredibly rude club' I think you would have no difficulty recognising such characteristics. Very best of luck and my full and unconditional support for you and all the moderators. Right. People so easily accept his explanations for things. For example, "he sold his house to finance building his reactors." Anybody can give any reason they want to for the things they do. It could be true or not. We can safely say that the explanation that he sold his house to finance his business is the explanation that casts him in a good light. It naturally leads to the thought, "nobody would sell their house to finance a non-working technology." The question that it is false doesn't so easily arise since the explanation is presented as fact. This factoid is actually true. From the horse's wife's mouth in direct conversation. Jed, that is not the work Mary Yugo was talking about, obviously. I directed her attention to the other report, as an example of what I find credible. I suggested she have a look at it. She then accidentally selected the wrong report. That's all there is to it. You should stop confusing the issue. I was replying to a MY's comment, which began with this sentence of you: "Have you discovered an error in the first set of tests by Levi?" So, what did you mean with "the first set of tests by Levi"? For me, and I think for MY, they are the 3 tests held in Bologna in the winter 2010/11, that is the tests you find in the first row of the attached jpeg (http://i.imgur.com/rB93G1X.jpg). I guess that these 3 tests are also those which triggered the interest of the vast majority of the people following this story, and which gave the maximum of scientific credentials to the Ecat, due to the numbers of the academic physicists which were involved, and the fame of their University. If they were wrong already in the first public demo, which other test should we consider? Thanks for your appreciation. Anyway, I'm here on L-F since almost a month, when I posted nearly the same infos: Rossi: “Steam Was Superheated” in 1MW Plant Test . Sorry, I can't. There is a lawsuit in course between two private parties. I'm not really interested in its outcome, nor I'd like to appear as a supporter of any part. Moreover, I'd prefer to avoid to become privy of any info that I cannot share on the web. I hope, you understand. I'm here only because 5 years ago I, as many other millions people, heard the astounding energy claims proclaimed by some academicians of a prominent Italian University. Unfortunately, since the beginning, these claims were unfounded and badly wrong, but since then they have been not retracted by those who had spread them all around the world. I just would like to see the scientific truth restored by some academic or scientific authority of my Country, not by a US court. Anyway, I'm willing, within the limit of my time and my English skill, to answer any question, provided they deal with material or procedural aspects of the tests held during 2011. But, all I can say could have been easily found by any expert or adviser in a normal technical due diligence. All the infos are available in the web since the beginning of this story. Initially, the temperature of the inflowing water was seven degrees Celsius and for a while the outlet temperature was 40 degrees Celsius. A flow rate of about one liter per second, equates to a peak power of 130 kilowatts. The power output was later stabilized at 15 to 20 kilowatts." That ecat has a single thermocouple, placed entirely by Rossi, in the output stream, to measure output water temperature. Simply moving it close to the large heater ("gargantuan" because it is the largest feature in the device) would cause wild overestimation of the output power. XXXXXXXXXXXXXXXXXXXXXXXXXXXXXXXXXXXXXXXXXXXXX, I don't know. A simple, "Joule" (resistance) heater calibration would have resolved the issue. Levi was asked again and again by many people including Josephson, to redo the experiment with proper calibration and a blank run and he never (NEVER EVER) replied to this challenge in any way. 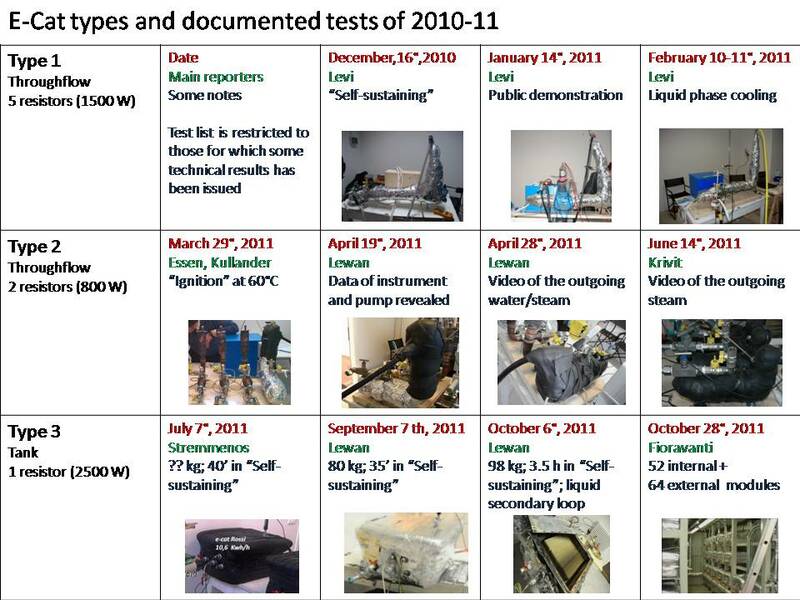 The experiments referred to by Rothwell and Ascoli are different ones and they were discredited in different ways. All Rossi experiments have giant gaping holes in calibration or verification. Clarke has raised the issue of emissivity errors in the various hot cat tests. Calibration in those tests did not include the full operating temperature range and left out the most critical. Input power monitoring was flawed or left up to Rossi wiring and equipment in some of the tests. Other tests confused wet and dry steam. Yet another test allowed a thermocouple misplacement again, this time on a heat exchanger where the thermocouple was deliberately placed too close to the hot end. In my opinion, none of these "errors" are accidental but each and every one was done by intent by Rossi with the purpose of deception. This of course is an opinion. Absent the opportunity to make my own measurements, I can not rigorously prove any of it. IH, at present, are the only ones who can conclusively prove that the ecat doesn't work. The post was edited 8 times, last by Alan Smith ( Jun 22nd 2016 ). There is no allegation of fraud. Only of the possibility of fraud. I specifically said I can't prove it. Amazing that you can't grasp that simple concept, Alan. Makes me wonder what else you are missing in this sordid Rossi story. This of course is an opinion. Absent the opportunity to make my own measurements, I can not rigorously prove any of it. IH, at present, are the only ones who can conclusively prove that the ecat doesn't work. The censorship and rude changes in other people's posts speaks to the lack of confidence the owners of this forum have in the validity of their conclusions. Allegations or imputations of fraud or possible fraud made from a safe distance while hiding behind an alias will always be removed. When you signed up to this forum you agreed (in the T&C) to be moderated. You just were. Actually it fits the scheme of "multiple redundancies"
Not exactly "redundancies". All of these overestimations were necessary all toghether to get the target of the demo. In its calorimetric report, a COP of about 12 was claimed. Moreover, there was the needing of increasing the output energy in order to exclude the possibility that the claimed output heat could have been attributed to the combustion of the gas coming from the hydrogen bottle connected to the Ecat. I know that there has been an intense activity around the two TPRs related to the hot-cat tests held in Ferrara and Lugano. But, sorry, I can't comment in detail these findings because I didn't examine the reports. I gave them just a look, but I suspended any further examination due to their lead author. Before spending my time in verifying those quite twisted and absolutely improbable results, I'd like to know how he justifies the blatantly wrong data reported in his first document about the January 2011 demo. Here's a crazy thought, Alan: why don't you try refuting what I said? That Levi's failure to replicate the most potentially successful ecat test ever is suspicious of incompetence or "you-know-what"? You don't think it's incompetence or ______ ? OK, prove it. I take no sides MY. Difficulty in replication might be an intensional IP protection mechanism. Rossi said that he has discovered a configuration whereby his IP is very difficult to replicate. This could be involved with startup. Ascoli65 - duly-noted and understood. Was it you that did the background work on Levi's paid research with Fulvio Fabiani for pinball software or firmware? If yes, can you please share the links to the university disclosure system where those payments were listed? The post was edited 2 times, last by frankwtu ( Jun 22nd 2016 ). Was it you that did the background work on Levi's paid research with Fulvio Fabiani for pinball software or firmware? No, absolutely not. I must also add that I have never spoken of these payments. If there have been irregularities in this regard, it is the duty of his University of finding them. I will not go into this kind of controversy. What interests me is that any professor or researcher of an Italian University makes his best in telling the scientific truth, because the people trust them and pay the taxes from which their regular salary comes. Frank - Your time at the grown-ups table may be limited if you keep this up. There was nothing irregular about the money paid to UniBo, it is recorded in the University public accounts (visible online) and all due taxes and fees were paid. Any suggestion (or fond thought) that 'brown envelopes' were passed over are total nonsense.